Looking for a dish that will punch your tastebuds to another dimension? 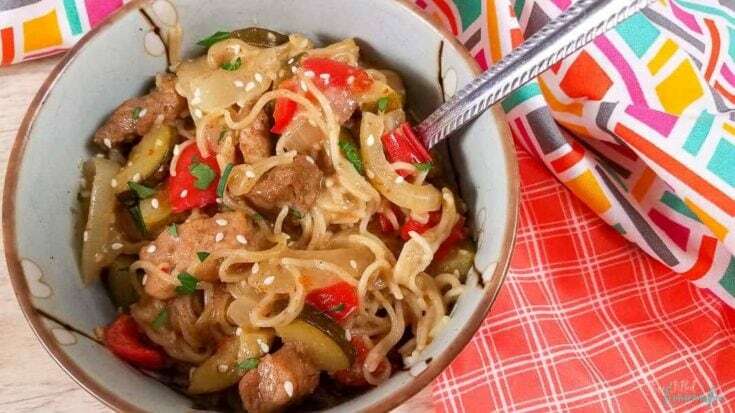 This Instant Pot Spicy Pork Noodles, pork freezer meals #3 is seriously out of this world. I love a little heat in my food. Actually, I probably enjoy more spice than the average person. Not everyone in my family feels the same way, except my husband who’s motto is “go big or go home.” I always recommend spicing up your own bowl, especially when little ones are sitting at the dinner table. 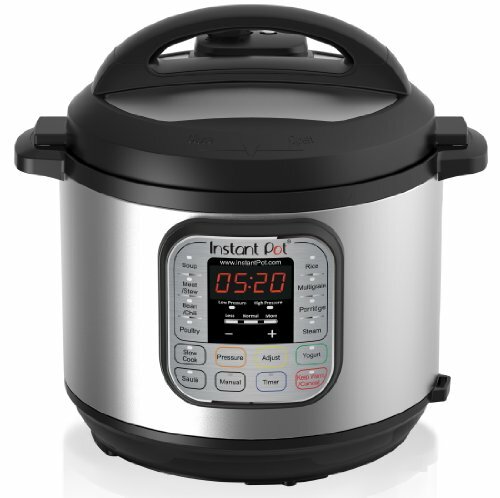 I’ve probably mentioned a time or two that I really like my Instant Pot. 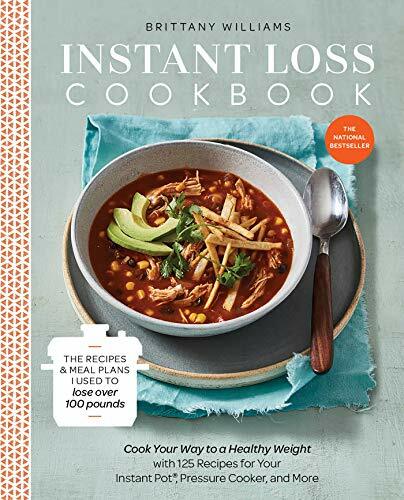 While I love it for its ability to make a tasty, wholesome meal, I also have a huge appreciation for Instant Pot Freezer Meals. I’ve found that during the winter months when I’m craving something hearty, freezer meals are the answer to satisfy my cravings. 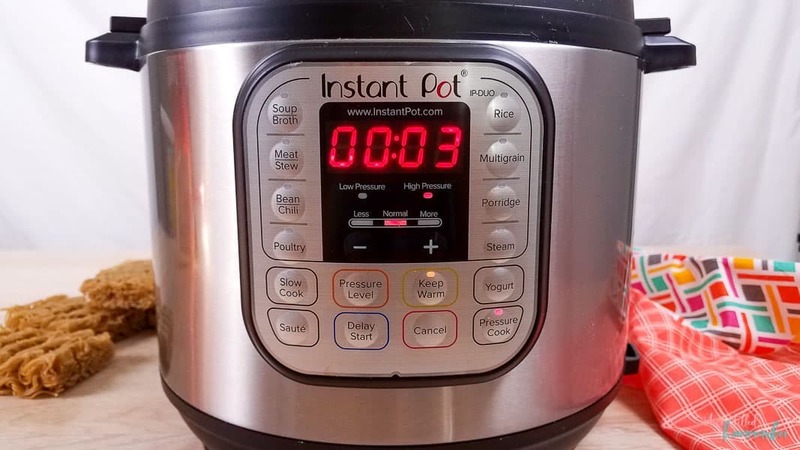 Being able to open the freezer and pull out dinner that basically just needs a few minutes in the Instant Pot is seriously simple and the Instant Pot simplifies it even more! 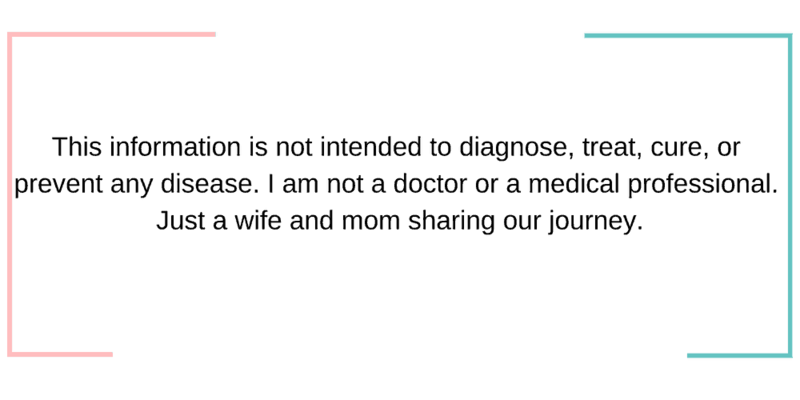 I get asked a lot of questions about freezer meals and I think it’s important to share some of those questions with you. 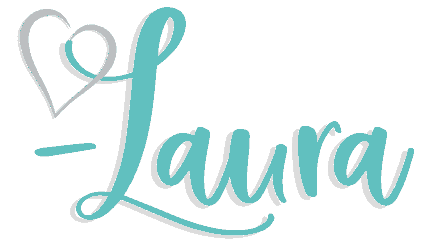 I hope this small Q&A session helps answer any question you may have. 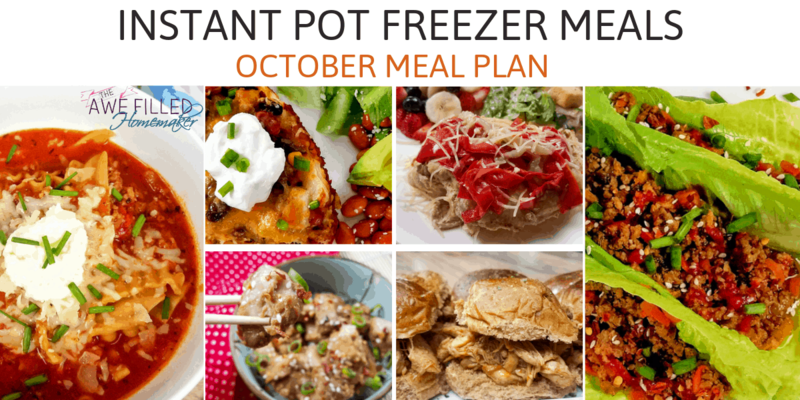 How do you meal plan using freezer meals? Using freezer meals is actually a super simple way to meal plan. Freezer meals allow you to plan ahead with ease. You have meals waiting for you to reheat. 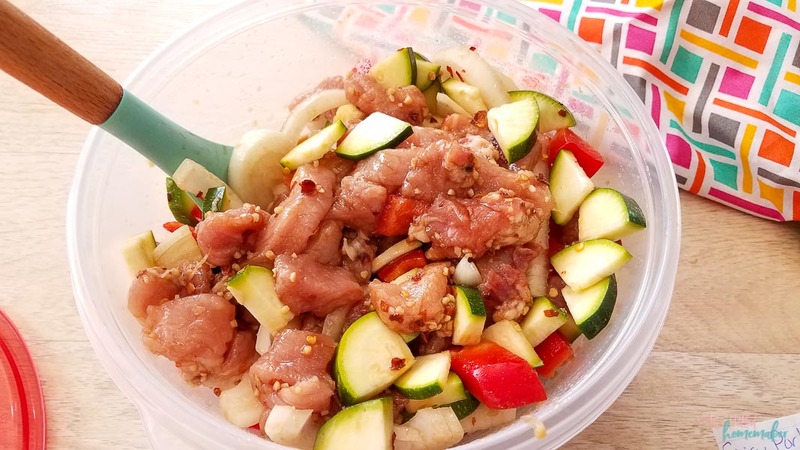 If you have a busy month scheduled, take one day and meal prep a whole bunch of freezer meals! Meal prepping may tie up the majority of your day, but it will save you so much stress and time later on down the road. Is there a type of meal or meat that works best for freezer meals? Actually, all different varieties of meat work great! 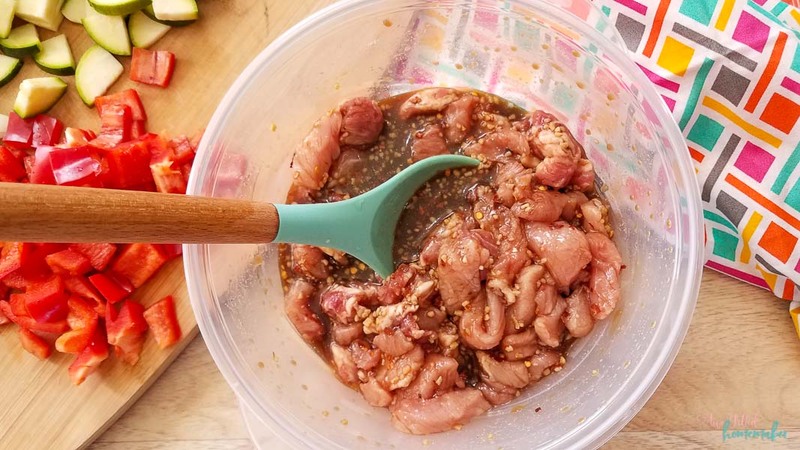 Chicken, beef, and pork are just a few of the great choices that you can use for freezer meals. 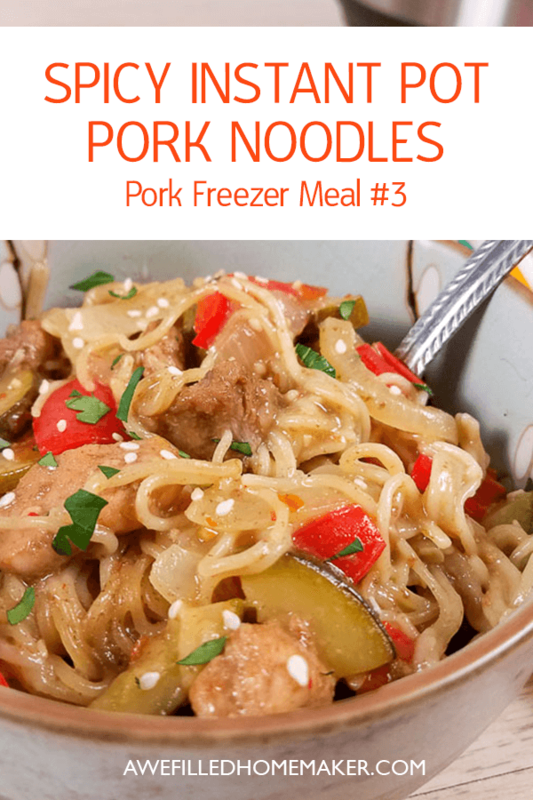 No worries on taste because freezer meals are moist and delicious each and every time! We love asian inspired dishes, like asian salmon, especially after my husband having being stationed in Korea. With a soy allergy though, we had to become creative and alter our favorite recipes. 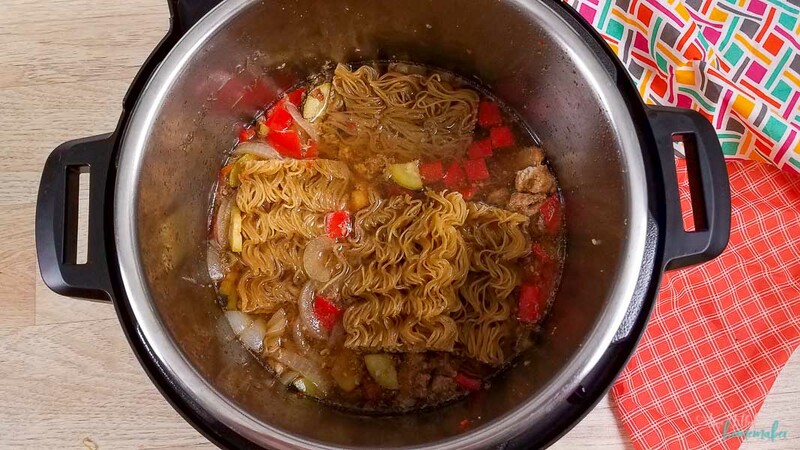 Thankfully that is easy to do and this spicy instant pot pork noodle recipe can remain on the menu. Not to mention the many benefits to avoiding ingredients we don’t need, like soy. 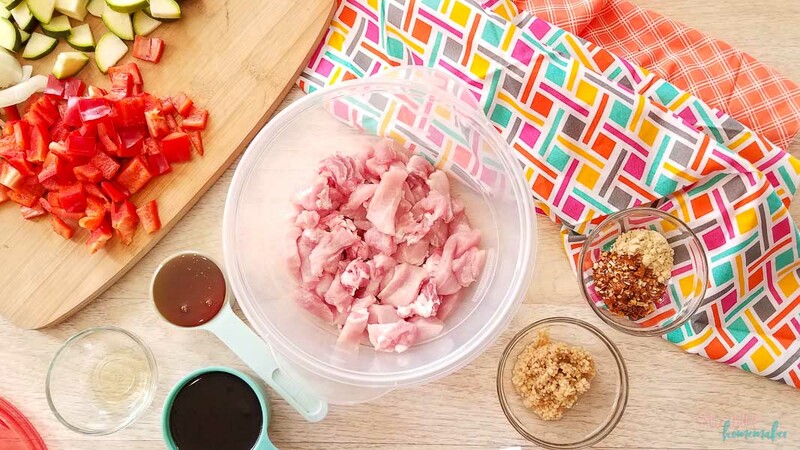 Introduction to Pork Freezer Meals– this kicks off the series and gets everything started. 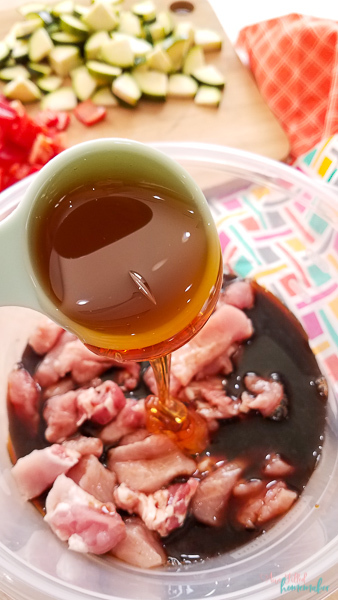 Pork freezer Meal #1, Instant pot honey “soy” pork tenderloin– this recipe is amazing and love the homemade “faux” soy sauce! 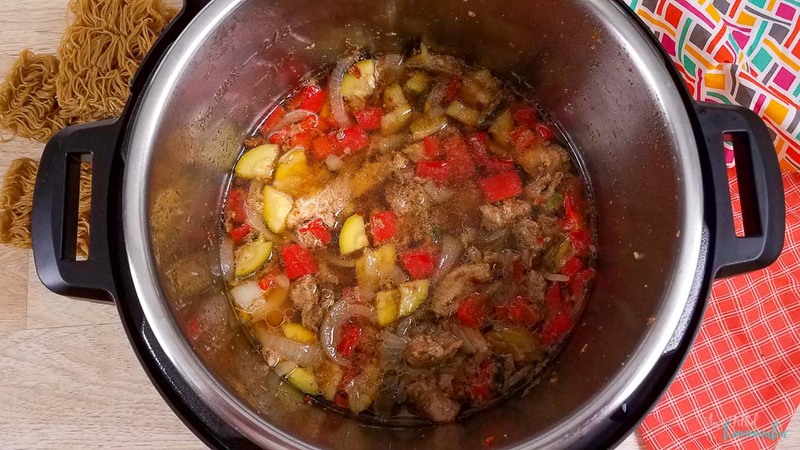 Pork Freezer Meal #2, Instant Pot Pork Bites– We love these! They are perfect for a low carb snack or appetizer! 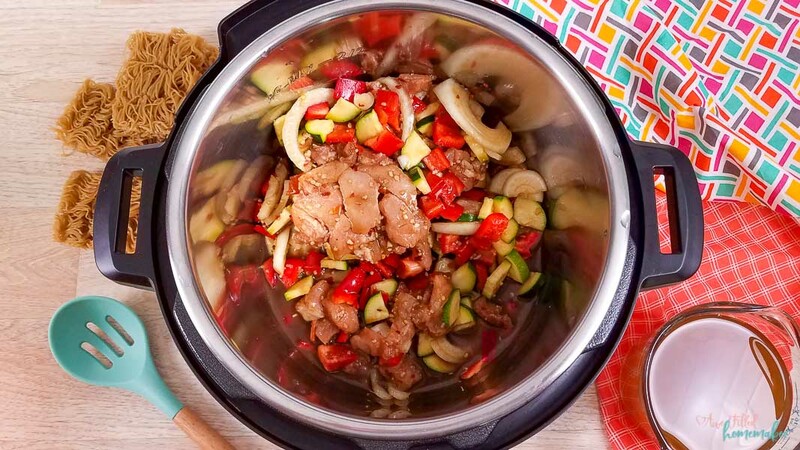 Ready to try this delicious Instant Pot recipe? 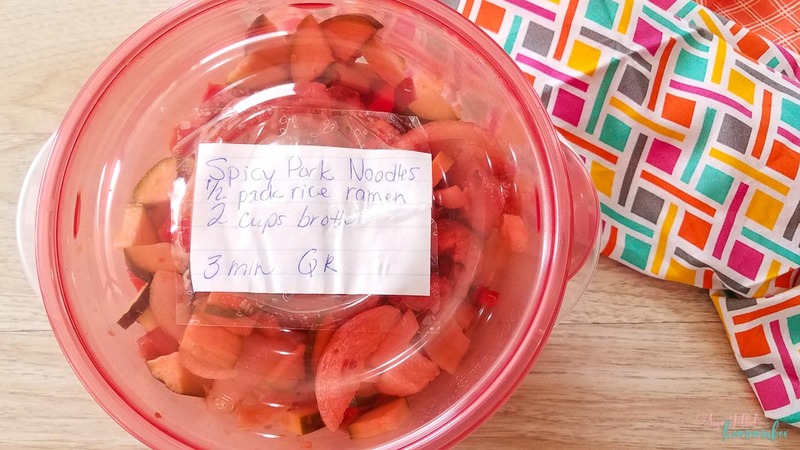 1) Mix all the ingredients, except the broth and noodles, together in a circular freezer safe container that fits inside the Instant Pot. NOTE: The reason for ensuring the container fits inside the instant pot, is so that after your meal is frozen, it fits nicely when you go to cook it. 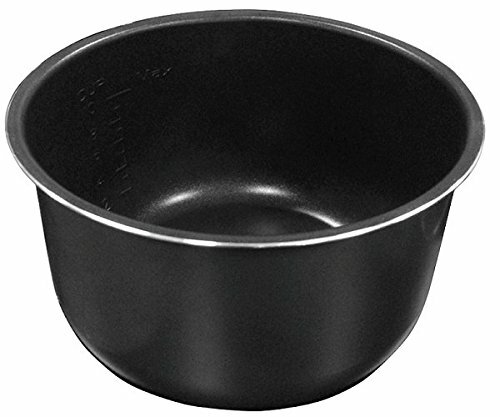 2) Place the lid on the container and add the cooking label. Place in the freezer for up to 1 month. 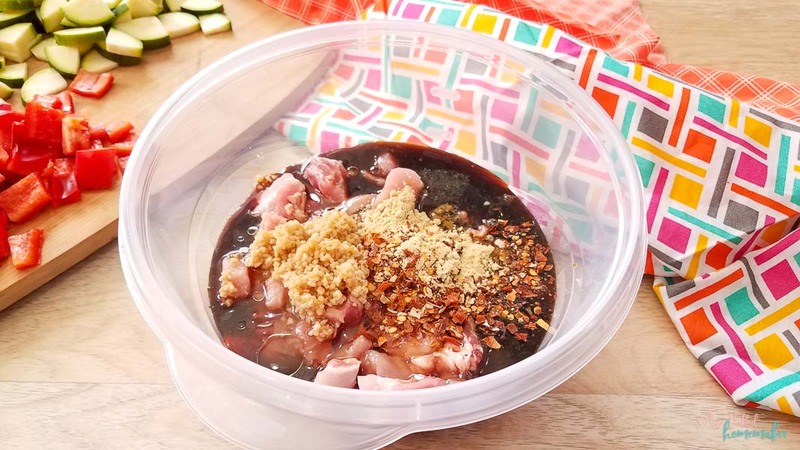 1) Defrost the spicy pork enough to remove from the container. A few minutes under cool water should be enough. Add to your inner pot for your instant pot. 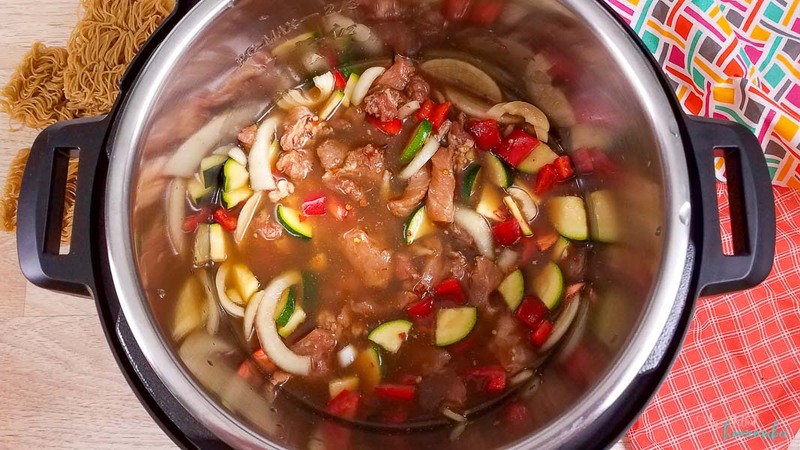 2) Pour the vegetable broth over the spicy pork. Close the lid and turn the pressure valve to sealing. 3) Cook the spicy pork on high pressure using the “manual” or “pressure release button” for 3 minutes. Using a utensil, turn the pressure valve to quickly release the pressure. Be careful from the hot steam escaping the pressure valve. 4) Remove the lid and switch the Instant Pot to sauté. 5) Place the ramen in the Instant Pot. Use a utensil to press the rice ramen into the liquid. Let the ramen sit for about 1 minute until it starts to loosen then break the noodles apart to finish cooking. If you don’t do this the brown rice ramen will cook into a lump. 6) Let the ramen simmer, stirring frequently, for another 3 minutes until it is tender and cooked through. The sauce will thicken as the ramen cooks. 7) Turn off the Instant Pot, serve and enjoy. Note: If you cannot find brown rice ramen noodles, you can use other whole wheat or regular spaghetti noodles. 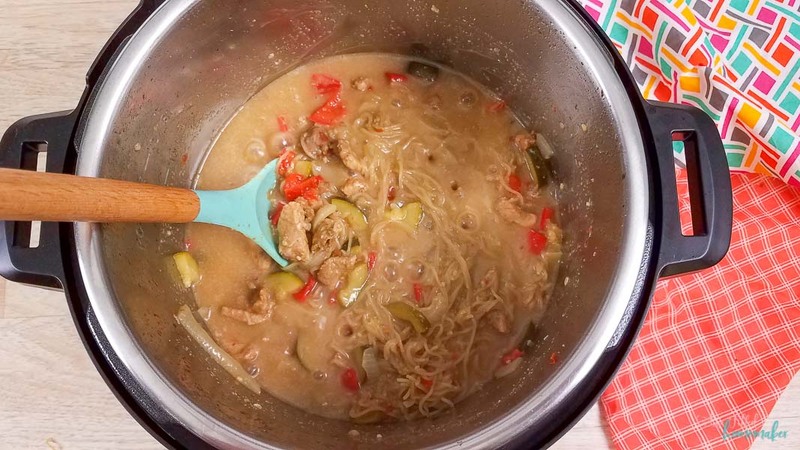 Just place the noodles in the Instant Pot under the freezer meal and cover it with 3 cups of liquid. The cooking time should remain the same. If you choose to use regular brown rice spaghetti noodles, follow the original directions. Be advised that brown rice spaghetti noodles may take a little longer to fully cook. Also, you can substitute the pork with chicken or beef if desired. 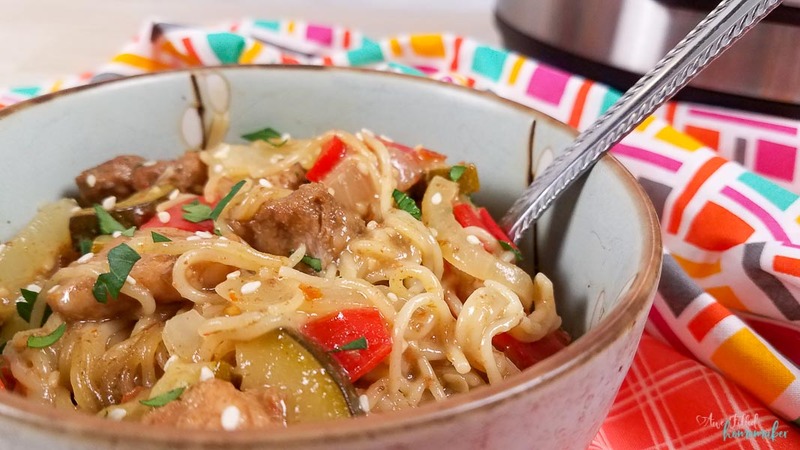 Seriously, you just created a simple Instant Pot freezer meal! 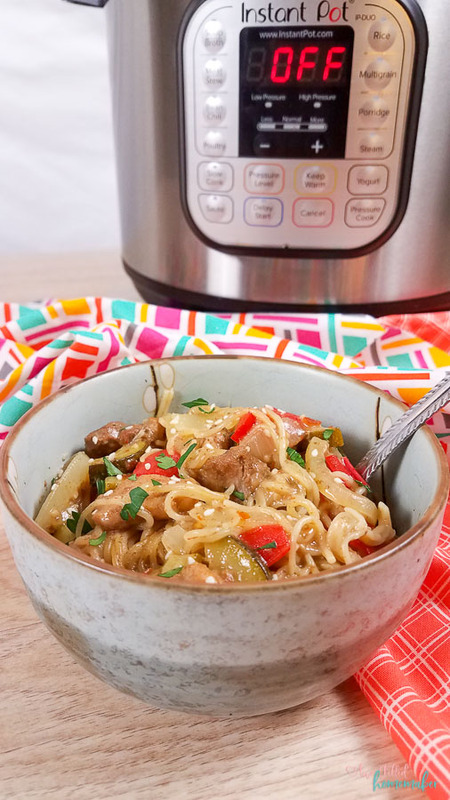 And just like that, you’ve created an amazing Instant Pot Pork Freezer meal! Didn’t I tell you this was super simple? You’ll be ecstatic later when you’re running low on time and needing something for dinner. 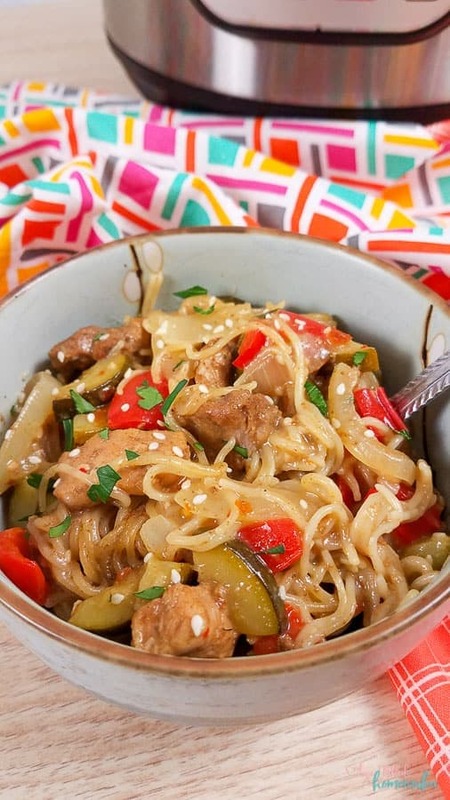 This Instant Pot Spicy Pork Noodle meal will be waiting! 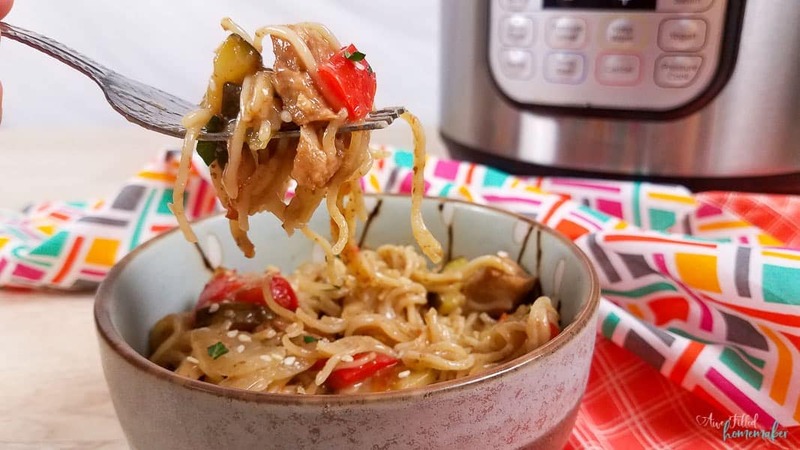 If you are looking for a similar recipe that isn’t a freezer meal, here’s my Teriyaki Chicken & Noodles. 1) Mix all the ingredients except the broth and noodles together in a circular freezer safe container that fits inside the Instant Pot. 3) Cook the spicy pork on high pressure using the “manual” or “pressure release button” for 3 minutes. Then use a back of a utensil or turn the pressure valve to quickly release the pressure.